Unfortunately, there are a few deranged people, who think nothing of stealing your hard earned Caravans, Boat Trailers, Horse Floats etc. These are easy targets for criminals, as they are often left unattended for extended periods of time. Fitting hitch locks or wheel clamps, means your prized possession. should still be where you parked it. Over the years, I have had a few different coupling Locks, and the latest being the Saracen Ultra, this is by far the best I've owned so far. I am quite impressed with this Saracen Ultra Trailer Hitch Lock by Purple Line. Using it on your Caravan, Boat, Horse Float etc, is quick and functional. Another great advantage, is you can now leave your trailer attached to your car, and drive without the need to remove the device first. 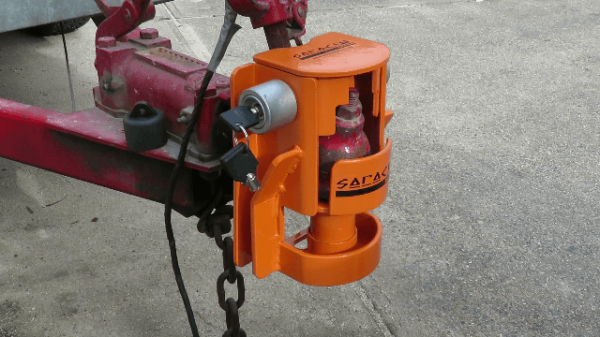 The Video Below shows my Saracen Ultra Trailer Hitch Lock attached to my work trailer. This Australian made Caravan and Trailer Hitch Lock, is constructed from a high strength composite metal, making it difficult to cut with any conventional hand tools. If you scroll to the 4.07 minute mark in this video, you will see a split screen on-road demo i did, showing two different viewpoints, with my car and trailer hitched while driving on the road. I also drove up and down driveways, to show the articulation of the coupling lock in action. While nothing will stop a determined thief, this lock will make it difficult for the opportunistic ones out there. I've been using this hitch lock for a few years now and I'm quite happy with it. I know its not goint to stop a determined thief, but it does makes it harder to steal my caravan.